Globalization, reorganizations and an increase in remote working call for a new take on collaboration. Employees need to be able to work together whenever and wherever. To facilitate this, you want to provide them with high quality collaboration tools. Tools that not only meet your IT standards, but also fit the needs of your business and the end user. When choosing a collaboration tool, we take the end users’ requirements as a starting point. We believe that we can increase tool usage by paying attention to their needs and involving them in the procurement. A broadly-accepted tool will not only result in a high ROI, it will also have a positive impact on employee job satisfaction and work efficiency. Strategy research Unified Communications: Duppal executes a strategy research for organizations that question how to move forward with their Collaboration needs. In this research, we will survey your employees to define the functional need. In combination with our knowledge of the collaboration market trends and the existing technical environment of your organization (network, current contracts and security policy) we define a short and long-term strategy for the Unified Communication environment of your organization. Project management: Implementation of a collaboration or UC tool is more than just a technical project. In every stage of the project it is important that there is a fit with the end users and stakeholders. Duppal is expert in implementing Skype for Business / Teams (including and excluding voice), see for example our customer MS Mode. Many of our customers use Skype for Business as their main communication tool in combination with Anywere365. We are official partner of WorkstreamPeople, making it possible to design call routing and A365 infrastructure. 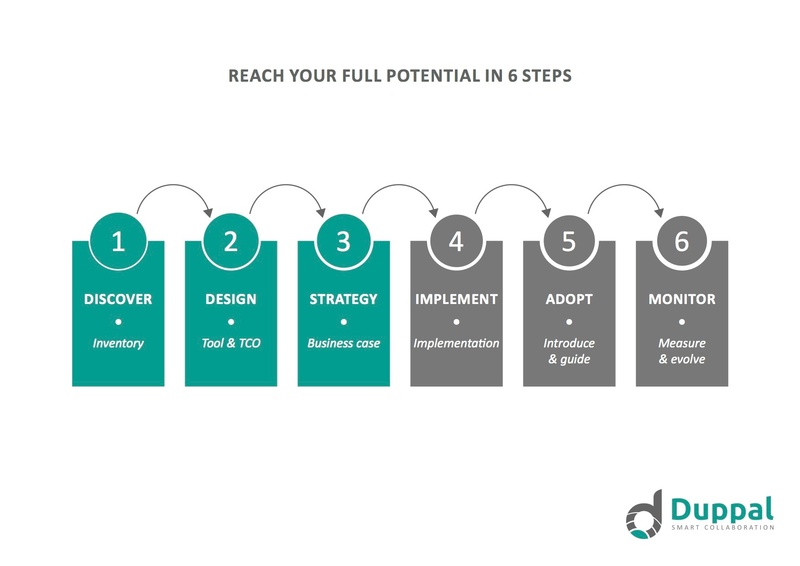 RFI/RFP/RFQ UC guidance: When your organization is ready for the next step in collaboration technology, Duppal can help you guide your process. From defining functional demands until RFP guidance. We have experts that can challenge you in translating your business needs to clear requirements for possible suppliers. As we dive into your business requirements and your end users’ needs, we can help you choose and implement the best collaboration tool. We’re happy to help you conducting a thorough research that addresses all the important factors of successfully introducing a new tool.